Inger, baptized Jan. 28, 1828. Ole, born March 28, 1833. Paul, born April 29, 1836. Knud, born Oct. 10, 1839. In 1824, Knud moved into the parish of Sand in Jelsa, where most of his children were baptized. (4) His marriage record calls him Knud Olsen Haaland, which would seem to indicate that he lived on a farm called Haaland, near Jelsa. In most records, Knud is listed as a “husmand,” which is a tenant who rents land on a larger farm. After his marriage, his name is generally followed by Sagbakken, the name of another farm. Anna died sometime before the Norwegian census was taken in 1865. In that census, Knud was identified as a widower living in the domicile of Sagebakken in the municipality of Jelsa. Knud is listed as a “Husmand med Jord,” which is just a longer version of the designation “husmand.” He was 65 years old. His unmarried daughter Berthe, age 36, is listed as the manager of her father’s household. Aside from Knud and Berthe, the household contained seven people, primarily Knud’s children and grandchildren. They included his son Ole, age 33, who was listed as a “søfarende,” or sailor; Ole’s wife Ellen Knudsdatter, age 30, who was born in Hjelmeland; and Ole’s children Anna, age 3, and Knud, age 1. Other residents were Knud’s son Knud, who was also a sailor; Knud Aagesen, age 13 and listed as “his sister’s son”; and a Ole Knudsen, who may have been a boarder with the family. The younger Ole Knudsen was 14 and was a servant of Magle Knudsdatter Osnæs. In the 1875 census, Knud was the head of the household at domicile known as Haaland, Sagbakken, in the municipality of Jelsa. He was still a widower and a “husmand med jord.” The household also contained the family of Gauthe Johannesson, who was a lodger on the farm. His wife was Lisebeth Larsdotter and his daughter was Johanna, age 1. (1) Knud’s birth year is listed as 1801 in Norway’s 1865 census and in 1800 in the 1875 census. His birth place is listed as Jelsa in both. The census records are available through the Norwegian Historical Data Center at www.rhd.uit.no. The church records are available online through the Norwegian archives’ website at www.arkivverket.no. The birth of a Knud Olsen to Ole Larsen and Brita Kirstine Knudsdotter on Oct. 21, 1803, in Jelsa, is listed in “Norway, Baptisms, 1634-1927,” index, FamilySearch.org. So far, Knud’s birth date is unknown, but various records put it in a range from 1800 to 1802. (2) The wedding date is provided in “Norway, Marriages, 1660-1926,” index, FamilySearch.org. However, in records for the Jelsa parish, I could find only the publican of the banns, which occurred on Oct. 7, 14 and 21. There is no date in the column labeled “Vielsesdagen,” or marriage day. The marriage record says Knud was 25 years old, which would put his birth year around 1802. The information on Paul Nilsen and his family comes from the 1801 census, which is available through the Norwegian archives at http://digitalarkivet.arkivverket.no/. (3) The birth records appear in the church records for 1828-1853 for Jelsa, Sand i Jelsa. Ingrer’s baptismal date is listed in her conformation record in 1844. Bertha is listed in the 1865 census. A Bertha Kirstine who was born Nov. 17, 1830 to a Knud Olsen and Anna Poulsdotter was very likely her. (4) Knud’s move is recorded in the records of the parish of Sand I Jelsa, Norway, in 1824. Ane Serine, born July 30, 1864. Ole, born March 16, 1866. Knud Olaus, born July 8, 1868. Marta, born Dec. 22, 1869. Berta Kristina, born Jan. 16, 1873. Karen Olava, born Jan. 7, 1876. Married Christopher Olson. Hanna, born Oct. 23, 1878. The 1900 U.S. Census for Norway Township, Humboldt County, Iowa, indicates that Helga had seven children, but only five survived to that point. Norwegian records show Paul and Helga living near Fister, which is in Hjelmeland, relatively near Stavanger. Records of his children’s births in the pastorate of Hjelmeland say Paul was a “husmand” – a tenant farmer. Other records indicate he was a “kirketjener,” which can mean either a minor church official or a sexton. The 1875 Census shows Helga and Paul living in the municipality of Hjelmeland og Fister in a domicile known as Fistervogen. Paul worked as a fisherman and was a “strandsitter,” which is a seaside tenant. 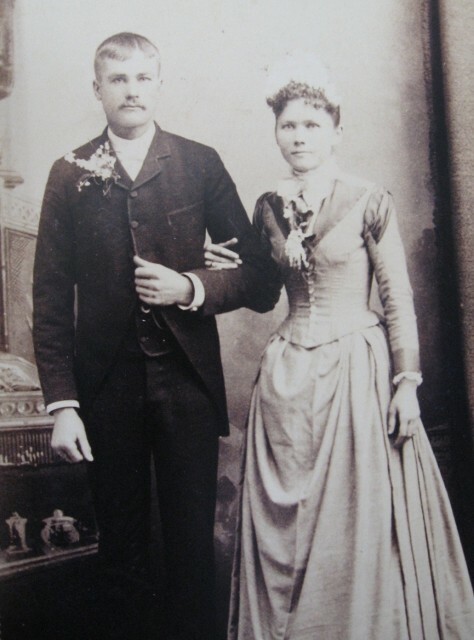 In addition to Paul and Helga, the household included their children: Anna, born in 1864; Ole, born in 1866; Martha, born in 1869; and Bartha, born in 1873. All of them were born in Fister. The household also included a lodger named Anna Beges., who earned her living by knitting and spinning, and her son, Anders Torstens, a hunting driver. Paul and Helga’s children Ole and Marta immigrated to the United States in 1882 or 1884. Although he was young, Ole was able to work hard enough to make money to help bring the rest of his family here. The rest – except Ane Serine and Knud Olaus – immigrated in 1891. Upon arrival in America, the family settled on Ole’s farm near the small town of Thor in Humboldt County, Iowa. Under the old Scandinavian naming system Paul’s last name derived from his father’s first name. He was Knud’s son so his name became Knudsen. A reversal of this tradition occurred after Paul’s immigration to the United States. Paul took the name Paulson – his son’s last name. This may be because Ole was already established in Iowa and it was convenient for Paul to take his son’s last name. In the 1900 Census, Paul Paulson and his wife Helga appear in Norway Township, which surrounds Thor. Paul is listed as a day laborer who had been unemployed for four months during the previous year. He had immigrated in 1891 and was still a resident alien. The census indicates that Helga had given birth to seven children but only five were still alive. Both Paul and Helga could read and write, but the census indicates that neither could speak English. The couple’s 21-year-old daughter Hanna also lived in the household and was employed doing “House work.” The family lived in a house, not on a farm. At some point after Helga’s death, Paul moved into the home of his daughter Olava. In the 1920 Census, he is listed with Olava and Christopher S. Olson in Thor. Paul is identified as Christopher’s 83-year-old father-in-law. He was a widower and unemployed. It says that Paul immigrated in 1891 and as a resident alien. Once again, the census notes that he could read and write but couldn’t speak English. Thor was a very small town and a notation along the side of the census page indicates that the streets were not named and the houses were not numbered. Paul died on Jan. 1, 1922 of cancer. The Paulsons are buried in Lot 37 at Ullensvang Cemetery in Norway Township, Humboldt County, near Thor, Iowa. (1) Birth information comes from church record A6 in Jelsa, Norway. Information on Paul and Helga was supplied by Marcy Schramm, daughter of Merrill Firebaugh, who obtained the church records through the Statsarkivet in Stavanger, Norway, and the pastorate (Soknepresten) in Hjelmeland, Norway. References in the following notes are to the original records cited by the archives in Stavanger or to the Soknepresten in Hjelmeland. I have been able to locate most of these records online through the Norwegian archives’ website at www.arkivverket.no. (2) Church record A10 in Hjelmeland. (3) Church record A5 in Suldal. (4) Pastorate (Soknepresten) in Hjelmeland. The name of Karen Olava’s husband is provided in the 1920 Census of Thor, Humboldt County, Iowa. (5) The census records for 1865 and 1875 are available through the Norwegian Historical Data Center at www.rhd.uit.no. (6) Church record A12 in Hjelmeland. The word used is “kirkevaegter,” which doesn’t appear in Norwegian dictionaries. Possibly this was a misspelling or a local spelling because “kirke” means church and “vekter” means watchman or “kirkeværge,” which is church warden. (7) Ullensvang Cemetery listing supplied by the Humboldt County Genealogical Society, which calls them by their “American” last name, Paulson. The society also provided Paul’s death record from the Humboldt County Courthouse. Peter Severin, born in August 1890 and died April 26, 1891. Selma, born Dec. 13, 1894. Oleda, born March 16, 1897. Married a man named Entler. Serral Edgar, born Feb. 25, 1900 and died Aug. 9, 1910. Edwin, born Jan. 13, 1903. Pearl Anabel, born April 19, 1906. Married Roy Fries. Gladys, born Feb. 19, 1909. Jack (Serral E.), born Oct. 27, 1911. Ole’s parents were Paul Knudsen and Helga Olsdatter. Under the old Scandinavian naming system Ole’s last name became “Paul’s son” - Paulson. Anna Serina Olson was born April 19, 1868 in Benton County, Iowa, to Soren and Anna (Johnson) Olson. Serina also appears as Sarah or Anna in some records. (4) Serina’s parents were immigrants from Norway, who moved from Benton County to Humboldt County when she was a girl. She told her grandchildren that she remembered when Indians came through Iowa looking for food. At the time of his wedding, Ole is listed as a laborer in Thor, Iowa. Ole became a citizen of the United States on Nov. 22, 1893 in Dakota City, Iowa, according to his naturalization papers. This account doesn’t quite line up with census records. The 1900 Census lists the family in Eagle Grove Township in Wright County, Iowa. Since that town isn’t listed in the account in Ole’s obituary, it’s likely that the family’s stay was relatively brief. In addition to Ole and Serina, the Paulson household included Anna H. (Helena), born in March 1892; Selma P., born in December 1894; Oleda, born in March 1897; and Cyril E. (Serral), born in February 1900. At this point, Serina had give birth to five children, but only four survived. The family was renting a house. At the time the census was taken, Ole was working as a day laborer but had been unemployed for three months in the previous year. Virtually all of the Paulsons’ neighbors worked for the railroad, as engineers, brakemen or firemen on locomotives. It was probably at this time that Ole landed a job with the Chicago Northwestern Railway. In his job as a foreman, he supervised a crew that maintained a stretch of track. This job provided Ole with a good living and he was able to support his family well. It is possible to pin the family’s move away from Laurens to within a week, because, in a highly unusual circumstance, they are listed in the 1910 Census twice. They appear in Laurens Village in Swan Lake Township in Pocahontas County, Iowa, where the census was taken April 27. And they also appear in Dakota Township, Humboldt County, where the census was taken May 4. The Laurens record indicates that Ole was a section foreman for the “C.N.W.R.R.” and that he rented his home. It doesn’t say anything about his immigration date but it does indicate that he was born in Norway. It indicates that Sarah A. had given birth to eight children, but only seven were still alive. Unfortunately, 10-year-old Serral would die that August. The children are listed as Helena A., age 18; Selma, age 15; Oleda, age 12; Siral, age 10; Edwin, age 7; Pearl, age 4 and Gladis, age 1½. The record from Dakota Township matches up pretty well, but spells the children’s name correctly and lists Gladys as 1. Ole is still listed as a section foreman and as renting a house. This record lists an immigration year of 1882, which would agree with family tradition, but not the other sources. The 1920 Census shows the family in Rutland Township, Humboldt County. Ole is listed as a section foreman on a steam railway who was renting his home. It says that he immigrated in 1885 and was naturalized in 1891, both of which appear to be inaccurate. The couple’s children are listed as Selma, age 25, a dressmaker at home; Olida, age 23, a saleswoman in a general store; Edwin, age 16; Pearl, age 13; Gladys, age 10; and Serral, age 8. Serral was the second child of that name to be born into the family. In the 1930 Census, the family appears in the town of Rutland, where they owned a home worth $5,000. They also owned a radio. Ole was still listed as a section foreman for a railroad. His immigration year is listed as 1883 this time. The rest of the household was Anna S., age 61; Selma P., age 35, a postmistress at the U.S. Post Office; Gladys B., a teacher in a rural school, age 21; and Seral E., age 18, a clerk in a general store. After his death, the money from the failed bank was released and Sarah was able to maintain herself. The Paulsons were active in the Rutland parish of the county’s Trinity Lutheran Churches. The Sept. 19, 1933, edition of The Humboldt Independent mentions that Mrs. Ole Paulson would be among the hostesses when the ladies aid society met at the Humboldt parsonage. She attended a meeting of the Lutheran ladies aid society in 1940, as reported in the Nov. 15 edition of The Humboldt Republican. In the 1940 Census, Sarah Paulson is listed as the widowed head of a household in the town of Rutland. The household included Selma P., age 45, a postmistress in the U.S. Post Office, who had an income of $900; Gladys B., age 31, a teacher in a public school, who had an income of $675; and a border named Mildred J. Rogners, age 30, who was a teacher in a public school, who had an income of $810. The census lists the education level of each person in the household. Sarah had four years of eduction, Selma had eight years and Gladys had graduated from high school. (1) Birth information comes from church records that cover 1853-1892 for the town of Fister in Hjelmeland, Norway. They are available online through the Norwegian archives’ website at www.arkivverket.no. (The town of Ole’s birth is sometimes called Fistervaag.) His birth date and place, as well as many other key dates and facts, are also listed in this obituary, which appeared in the Nov. 8, 1935, edition of the Humboldt Republican of Humboldt, Iowa. Much of the remaining information comes from a questionnaire and interviews with Pearl Fries in 1989 and 1990. (2) Children and dates of birth come from unpublished genealogy of Soren Olson’s family provided by the Humboldt County Genealogical Society. The names and approximate years generally agree with census records for 1910 to 1930. The married names of most of the daughters appear in Serina’s obituary in the June 27, 1952, edition of The Humboldt Republican. (2a) Ole’s immigration year is indicated in the 1910 Census of Dakota Township, Humboldt County, Iowa. The 1920 Census of Rutland Township, Humboldt County, says he immigrated in 1885 and was naturalized in 1891. The 1930 Census of Rutland Township lists his immigration year as 1883. I have chosen to follow the dates in the 1910 Census since naturalization year agrees with that listed on his naturalization papers. (3) Ole and Sarah’s marriage certificate was supplied by the Humboldt County Genealogical Society. (4) All dates for Serina, as well as the name of her father and birth place, come from her obituary. Names of parents are confirmed in the 1880 U.S. Census of Norway Township, Humboldt County, Iowa. (4a) The death notice is in the Nov. 1, 1935, edition of The Humboldt Republican. (5) Ullensvang Cemetery listing supplied by the Humboldt County Genealogical Society.